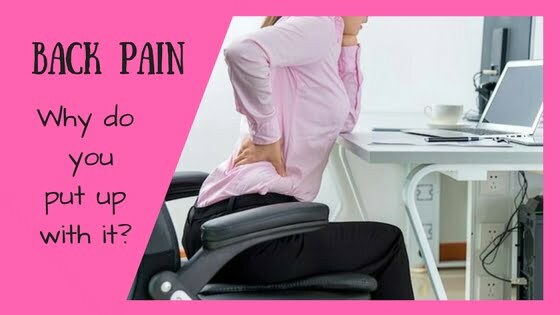 Back pain – Why do you put up with it? People put up with back pain for many reasons – because they believe you have to “just get on with it”, or because someone in a white coat told them “you have to learn to live with it”, or because they have tried but not found any solution, or because they don’t understand what caused it in the first place. The good news is, you don’t have to put up with back pain! The good news is, you don’t just have to put up with back pain, or any other pain. There is always something you can do, even if your symptoms are part of a condition such as arthritis that really won’t just go away. At your first appointment, the Osteopath listens to your story and examines you to diagnose your problem. Your background and your day-to-day life now are relevant. Maybe you have a bad back since an accident, or your work activities have caused a strain, or you have a sports injury from your favourite sport. These factors play a part in what caused your back pain (or neck pain, shoulder pain, wherever it hurts). Posture is often a big contributor – unnecessary tension, holding yourself in a hunch, not breathing freely, not getting enough general movement in your day. Osteopathic treatment aims to gently ease and relax and lengthen tissues which are too tight, too held, too stuck. Treatment also involves helping you understand where this problem is coming from, because as you get to know more about how your body works you will be more able to look after yourself. Ask yourself – why do you put up with the pain? Then just give us a call, we can help.